Below, you'll find an Equipment guide for Skyward Sword, listing all of Equipment that have been seen within screenshots and trailers of the game thus far. The information is incomplete and will be updated as more information becomes available. For full context as to where each of these Equipment can be found, be sure to take a look at our Skyward Sword Walkthrough. The Wooden Shield returns in Skyward Sword in the same fashion as in previous Zelda games. Instructor Horwell gives Link this Shield before he goes to search for Zelda, but Link can also buy it at the Item Shop in Bazaar on Skyloft. This Shield is very weak, and is susceptible to fire and enemy attacks. It can be later upgraded to the Banded Shield and the Braced Shield. For more information, check out our Upgrades page. For more information on upgrading the Wooden Shield, check out our Upgrades page. Read More about the Wooden Shield at the Zelda Dungeon Wiki. 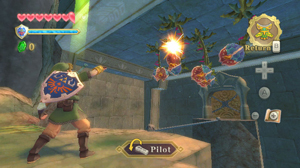 The Banded Shield is the second Shield encountered in Skyward Sword and offers a much greater resistance to attacks then that of the Wooden Shield. Where the Wooden Shield failed against enemy attacks, this Shield will be able to take much more damage. The Banded Shield is upgraded from the Wooden Shield and upgrades to the Braced Shield. For more information, check out our Upgrades page. For more information on upgrading the Banded Shield, check out our Upgrades page. Read More about the Banded Shield at the Zelda Dungeon Wiki. 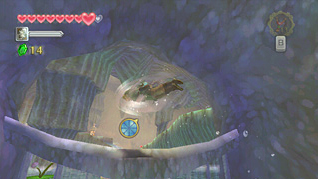 The Braced Shield is the third Shield encountered in Skyward Sword and offers a much greater resistance to attacks then that of the Banded Shield. This Shield will also protect against electric attacks, but still won't block fire attacks. It is upgraded from the Wooden Shield and the Banded Shield. For more information, check out our Upgrades page. For more information on upgrading the Braced Shield, check out our Upgrades page. 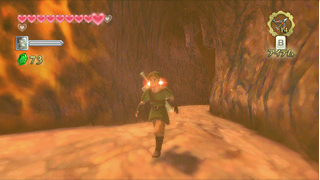 Read More about the Braced Shield at the Zelda Dungeon Wiki. The Iron Shield is an upgraded version of the wooden type of shield. It is much more durable than the Wooden Shield, and is also immune to burning. Unlike the Wooden Shield, it is weak against electrical based attacks. It can be later upgraded to the Reinforced Shield and the Fortified Shield. For more information, check out our Upgrades page. For more information on upgrading the Iron Shield, check out our Upgrades page. Read More about the Iron Shield at the Zelda Dungeon Wiki. The Reinforced Shield is the first shield upgraded from the Iron Shield. It will still take damage from melee attacks, but offers more defensive power and increased durability. It is upgraded from the Iron Shield and upgrades to the Fortified Shield. For more information, check out our Upgrades page. For more information on upgrading the Reinforced Shield, check out our Upgrades page. Read More about the Reinforced Shield at the Zelda Dungeon Wiki. The Fortified Shield is the second shield upgraded from the Iron Shield. This is the toughest shield made of iron, but it still doesn't protect against electric attacks. It is upgraded from the Iron Shield and the Reinforced Shield. For more information, check out our Upgrades page. For more information on upgrading the Fortified Shield, check out our Upgrades page. Read More about the Fortified Shield at the Zelda Dungeon Wiki. This shield is very Sacred, as the name implies. It has a short damage meter, but it will slowly replenish when damaged. It resists most types of attacks including Fire and Electricity, and has high durability. It is upgraded to the Divine Shield and the Goddess Shield. For more information, check out our Upgrades page. For more information on upgrading the Sacred Shield, check out our Upgrades page. Read More about the Sacred Shield at the Zelda Dungeon Wiki. The Divine Shield is the first upgraded form of the Sacred Shield. It is more durable than the Sacred Shield, and like it, shares the power to restore itself over time. It is upgraded from the Sacred Shield and upgrades to the Goddess Shield. For more information, check out our Upgrades page. For more information on upgrading the Divine Shield, check out our Upgrades page. Read More about the Divine Shield at the Zelda Dungeon Wiki. The Goddess Shield is the second upgraded form of the Sacred Shield. It is more durable than the Divine Shield, and like it and the Sacred Shield, can restore itself over time. It is upgraded from the Sacred Shield and the Divine Shield. For more information, check out our Upgrades page. For more information on upgrading the Goddess Shield, check out our Upgrades page. Read More about the Goddess Shield at the Zelda Dungeon Wiki. The final shield in the game is the legendary Hylian shield used by heroes all across time, future and past. Unique from all the other shields in the game, the Hylian Shield is unbreakable and resistant against fire and electricity. The Hylian Shield is aquired after completing eight boss battles in the Thunder Dragon's Lightning Round. This boss challenge is not available until after Link has completed the Thunder Dragon's portion of the Song of the Hero. Read More about Hylian Shield at the Zelda Dungeon Wiki. After Link's Loftwing disappears, Link will head into Sparring Hall and pick up the Practice Sword. It is an ordinary, mortal blade that will do well against the enemies in Skyloft. 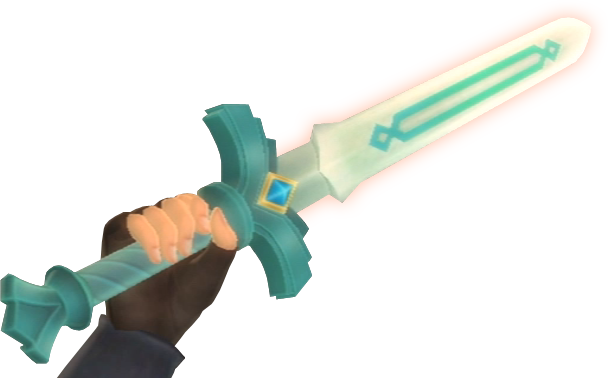 While this sword does seem worthy, Link must find a much more powerful sword before he can fight the enemies below. 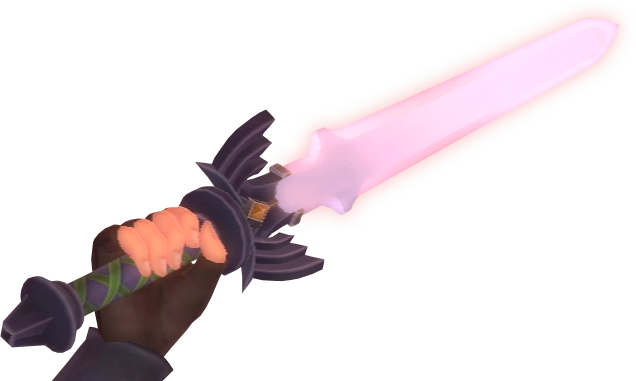 For more information on its upgrade, check out the Goddess Sword at the Zelda Dungeon Wiki. 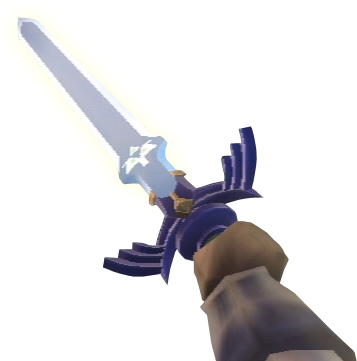 Read More about the Practice Sword at the Zelda Dungeon Wiki. After Zelda disappears to the land below, Link will find Fi waiting outside his room. Fi will lead Link to the Goddess Statue, and open a way inside of it where the Goddess Sword is located. After picking it up and lifting it to the Sky, this divine blade will become his sword for much of the rest of the game. 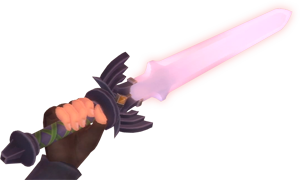 The Goddess Sword can detect several items through a feature called ��Dowsing�� and can also shoot powerful beams of energy from the Goddess herself by raising the sword ��Skyward�� and letting it charge up. 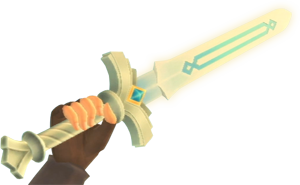 For more information on its upgrade, check out the Goddess Long Sword at the Zelda Dungeon Wiki. Read More about the Goddess Sword at the Zelda Dungeon Wiki. The Goddess Long Sword is the second form of the Goddess Sword. After defeating Koloktos in the Ancient Cistern, Link will walk into a room housing Farore's Sacred Flame, which Fi will then use to power up the Goddess Sword. The Goddess Long Sword is longer and will do double the damage of the Goddess Sword, making enemies and bosses much easier to defeat. 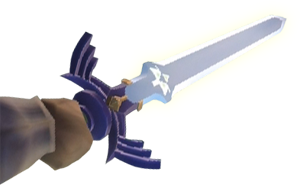 Read More about the Goddess Long Sword at the Zelda Dungeon Wiki. After defeating Tentalus on the Sandship, Link will find Nayru's Sacred Flame. Fi will then use its power to upgrade the Goddess Long Sword to the Goddess White Sword. 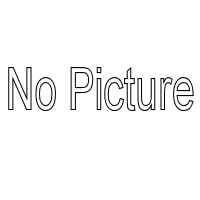 This sword is much whiter than the previous incarnation, and is more pure as well. It will give Link enhanced dowsing abilities. For more information on its upgrade, check out the Master Sword at the Zelda Dungeon Wiki. This sword has enhanced dowsing abilities making it easier to locate treasure. After defeating Ghirahim in the Fire Sanctuary, Link will find Din's Sacred Flame. 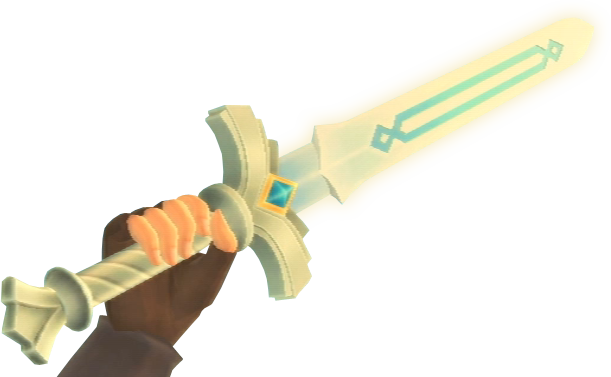 Fi will then use its power to upgrade the Goddess White Sword to this near perfect sword, the Master Sword. This blade possesses three times the power of the Goddess Sword and is the bane of all evil, but it is not yet complete. This sword has enhanced dowsing abilities making it easier to locate treasure. 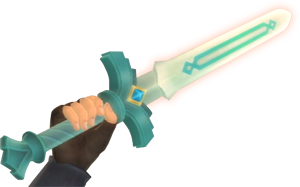 For more information on its upgrade, check out the True Master Sword at the Zelda Dungeon Wiki. 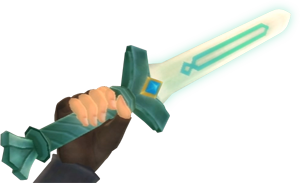 Read More about Master Sword at the Zelda Dungeon Wiki. After going into the Past, Link will meet up with Zelda in the Temple of Hylia. She will then bless the Master Sword, making it the True Master Sword, and the one with the power to repel Demise. With the True Master Sword, Link has the power to seek out the land�s greatest power, the legendary Triforce. 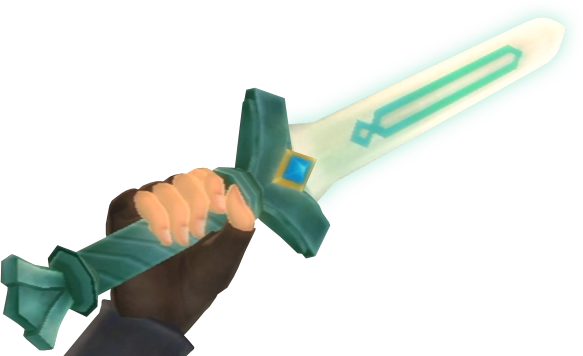 Read More about True Master Sword at the Zelda Dungeon Wiki. 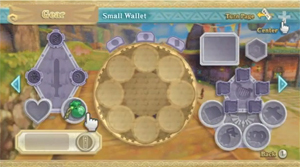 From the start of Skyward Sword you will have in your posession the Small Wallet. This wallet can carry up to 300 rupees at a time. For more information on upgrading the Small Wallet, check out our Upgrades page. Read More about Small Wallet at the Zelda Dungeon Wiki. This Wallet can be bought from Beedle's Air Shop early on in the game. It will cost 100 rupees, but will hold an extra 300 rupees. Three of these Extra Wallets can be bought from the Airshop throughout the game. For more information on upgrading the Extra Wallet, check out our Upgrades page. 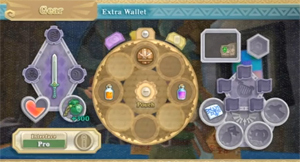 Read More about Extra Wallet at the Zelda Dungeon Wiki. After completing the 'Finding Kukiel' sidequest, Batreaux will ask you to find Gratitude Crystals for him. After obtaining 5 Crystals, you can return to Batreaux and he will give the Medium Wallet. This wallet will hold up to 500 rupees, along with any extra space given by Extra Wallets. For more information on upgrading the Medium Wallet, check out our Upgrades page. Read More about Medium Wallet at the Zelda Dungeon Wiki. After completing the 'Finding Kukiel' sidequest, Batreaux will ask you to find Gratitude Crystals for him. After obtaining 30 Crystals, you can return to Batreaux and he will give the Big Wallet. This wallet will hold up to 1000 rupees, along with any extra space given by Extra Wallets. For more information on upgrading the Big Wallet, check out our Upgrades page. 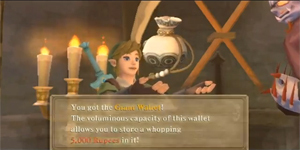 Read More about Big Wallet at the Zelda Dungeon Wiki. After completing the 'Finding Kukiel' sidequest, Batreaux will ask you to find Gratitude Crystals for him. After obtaining 50 Crystals, you can return to Batreaux and he will give the Giant Wallet. This wallet will hold up to 5000 rupees, along with any extra space given by Extra Wallets. For more information on upgrading Giant Wallet, check out our Upgrades page. Read More about Giant Wallet at the Zelda Dungeon Wiki. After completing the 'Finding Kukiel' sidequest, Batreaux will ask you to find Gratitude Crystals for him. After obtaining 80 Crystals, you can return to Batreaux and he will give the Tycoon Wallet. This wallet will hold up to 9000 rupees, along with any extra space given by Extra Wallets. For more information on upgrading to the Tycoon Wallet, check out our Upgrades page. Read More about Tycoon Wallet at the Zelda Dungeon Wiki. The Seed Satchel is obtained with the Slingshot after finding all the Kikwi for the Kikwi Elder. It will hold up to 10 Deku Seeds at a time. For more information on upgrading Seed Satchels, check out our Upgrades page. For more information on its upgrades, check out the Small Seed Satchel , the Medium Seed Satchel and Large Seed Satchel pages at the Zelda Dungeon Wiki. Read More about the Seed Satchel at the Zelda Dungeon Wiki. Two Small Seed Satchels can obtained throughout Skyward Sword, and each will hold up to 10 extra Deku Seeds. The first Small Seed Satchel can be bought from the Gear Shop in the Bazaar on Skyloft for 100 rupees. The second can be found in a Goddess Chest after activating a Goddess Cube in the Eldin Volcano region. The chest can be found west of Fun Fun Island. For more information on its previous incarnation and its upgrades, check out the Seed Satchel , the Medium Seed Satchel and Large Seed Satchel pages at the Zelda Dungeon Wiki. Read More about the Small Seed Satchel at the Zelda Dungeon Wiki. The Medium Seed Satchel can be upgraded from the Small Seed Satchel at the Scrap Shop in the Bazaar on Skyloft. This Satchel will hold an extra 20 Deku Seeds. For more information on its previous incarnations and its upgrade, check out the Seed Satchel , the Small Seed Satchel and the Large Seed Satchel pages at the Zelda Dungeon Wiki. Read More about the Medium Seed Satchel at the Zelda Dungeon Wiki. The Large Seed Satchel can be upgraded from the Medium Seed Satchel at the Scrap Shop in the Bazaar on Skyloft. This Satchel will hold an extra 30 Deku Seeds. For more information on its previous incarnations, check out the Seed Satchel , the Small Seed Satchel and the Medium Seed Satchel pages at the Zelda Dungeon Wiki. 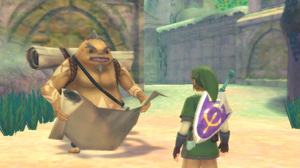 Read More about the Large Seed Satchel at the Zelda Dungeon Wiki. The Bomb Bag is obtained with the Bombs in the Earth Temple after defeating the miniboss, Lizalfos. It will allow you to hold up to 10 bombs at a time. For more information on upgrading Bomb Bags, check out our Upgrades page. For more information on its upgrades, check out the Small Bomb Bag , the Medium Bomb Bag and Large Bomb bag pages at the Zelda Dungeon Wiki. Read More about the Bomb Bag at the Zelda Dungeon Wiki. The Small Bomb Bag can be bought from the Gear Shop in the Bazaar on Skyloft for 150 rupees. It will allow you to hold an extra 5 bombs. For more information on its previous incarnation and its upgrades, check out the Bomb Bag , the Medium Bomb Bag and Large Bomb Bag pages at the Zelda Dungeon Wiki. Read More about the Small Bomb Bag at the Zelda Dungeon Wiki. The Medium Bomb Bag can be upgraded from the Small Bomb Bag at the Scrap Shop in the Bazaar on Skyloft. It will allow you to hold an extra 10 bombs. For more information on its previous incarnations and its upgrade, check out the Bomb Bag , the Small Bomb Bag and the Large Bomb Bag pages at the Zelda Dungeon Wiki. Read More about the Medium Bomb Bag at the Zelda Dungeon Wiki. The Large Bomb Bag can be upgraded from the Medium Bomb Bag at the Scrap Shop in the Bazaar on Skyloft. It will allow you to hold an extra 15 bombs. For more information on its previous incarnations, check out the Bomb Bag , the Small Bomb Bag and the Medium Bomb Bag pages at the Zelda Dungeon Wiki. Read More about the Large Bomb Bag at the Zelda Dungeon Wiki. The Quiver is obtained with the Bow after defeating the miniboss of the Sandship, Scervo. This Quiver will allow you to hold 20 arrows at a time. For more information on upgrading Quivers, check out our Upgrades page. For more information on its upgrades, check out the Small Quiver , the Medium Quiver and Large Quiver pages at the Zelda Dungeon Wiki. Read More about the Quiver at the Zelda Dungeon Wiki. The Small Quiver can be bought from the Gear Shop in the Bazaar on Skyloft. It will allow you to hold up to 25 arrows at a time. For more information on its previous incarnation and its upgrades, check out the Quiver , the Medium Quiver and Large Quiver pages at the Zelda Dungeon Wiki. Read More about the Small Quiver at the Zelda Dungeon Wiki. The Medium Quiver can be upgraded from the Small Quiver at the Scrap Shop in the Bazaar on Skyloft. It will allow you to hold up to 30 arrows at a time. For more information on its previous incarnations and its upgrade, check out the Quiver , the Small Quiver and the Large Quiver pages at the Zelda Dungeon Wiki. Read More about the Medium Quiver at the Zelda Dungeon Wiki. The Large Quiver can be upgraded from the Medium Quiver at the Scrap Shop in the Bazaar on Skyloft. It will allow you to hold up to 35 arrows at a time. For more information on its previous incarnations, check out the Quiver , the Small Quiver and the Medium Quiver pages at the Zelda Dungeon Wiki. Read More about the Large Quiver at the Zelda Dungeon Wiki. The Adventure Pouch is given to Link by Fledge after he starts his journey to look for Zelda. When he first receives the pouch, it will have four pockets that will allow him to carry different items. This Pouch can be upgraded to have more pockets, allowing more items to be held. 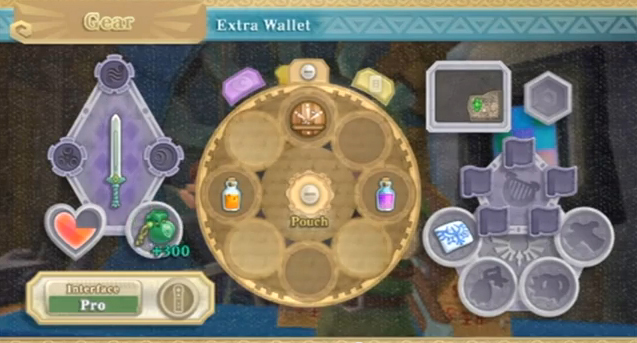 The first three upgrades to the Pouch can be bought at Beedle's Airshop. The first for 300 rupees, the second for 600 rupees, and the third for 1200 rupees. The fourth and final upgrade can be found in a Goddess Chest on Pumpkin Island. The respective Goddess Cube in the first one hit in the Deep Woods - the one Gorko the Goron is standing next to upon entry. Read More about the Adventure Pouch at the Zelda Dungeon Wiki. The Amber Tablet is a piece of rock found in the Earth Temple Spring, found in the back room of the Earth Temple. After performing a Skyward Strike, the Tablet will appear in the Spring. The Tablet can then be taken to the Goddess Statue on Skyloft and placed with the Emerald Tablet and the Ruby Tablet, creating a new entry to the Surface over the Lanayru region. Read More about the Amber Tablet at the Zelda Dungeon Wiki. The Bird Statuette is obtained during the Wing Ceremony early in the game. To obtain it, Link must catch up with the yellow bird flying across the sky. After grabbing it, Link will give it to Zelda, who will place it inside the Statue of the Goddess. Read More about the Bird Statuette at the Zelda Dungeon Wiki. The Emerald Tablet is a piece of rock given to Link by Fi inside the Statue of the Goddess. When Link places the tablet on the wall at the back of the room, it will cause the Statue to send out a beam of light that will open the clouds below Skyloft, allowing him to access the Faron region of the Surface. Read More about the Emerald Tablet at the Zelda Dungeon Wiki. Link will receive these earrings after completing the Eldin Volcano Silent Realm. They will protect him from the incredibly hot areas of the Volcano, allowing him to travel inside. Read More about Fireshield Earrings at the Zelda Dungeon Wiki. Link can find the Golden Carving inside a treasure chest in the Skyview Temple, and it serves as the boss key of the Temple. Link must carefully turn and rotate the sculpture to fit inside the hole of the boss door. When properly inserted, it will open the door. 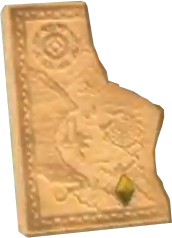 Read More about the Gold Sculpture at the Zelda Dungeon Wiki. These have appeared since the first Zelda game and return in Skyward Sword as the items that increase Link's maximum hearts by 1. They will be acquired after each boss battle as usual, with a gorgeous new ornate appearance. Link can also create Heart Containers by collecting four Heart Piece in the overworld or in dungeons. Read More about the Heart Container at the Zelda Dungeon Wiki. The Ruby Tablet is a piece of rock found in the Skyview Spring, found in the back room of the Skyview Temple. After performing a Skyward Strike, the Tablet will appear in the Spring. The Tablet can then be taken to the Goddess Statue on Skyloft and placed with the Emerald Tablet, creating a new entry to the Surface over the Eldin region. Read More about the Ruby Tablet at the Zelda Dungeon Wiki. The Water Dragon Scale is received after completing the Faron Woods Silent Realm. It will allow Link to swim underwater, as well as spin through and out of the water. Read More about Water Dragon Scale at the Zelda Dungeon Wiki.